The world largest B2B leisure marine equipment show, which brings the marine industry together for decades was over before we knew it. In most cases this is a good sign. But maybe you would have liked to meet up with Newthex and didn’t get the chance. Currently we are working on beautiful project and tailor made solutions for our clients world wide. To make our products ever more effective and appealing we are continuously innovating. If you would like to know more more about our expertise or if you are interested in a complete package for your future vessel like we delivered for the super yacht ‘GO’ for Turquoise Yachts (picture background of our stand). Don’t hesitate and make an appointment. 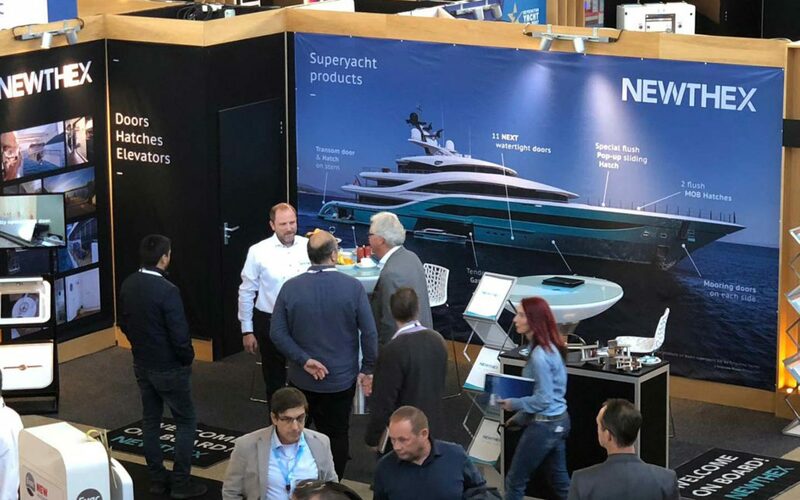 https://newthex.com/wp-content/uploads/2018/11/newthex-metstrade-superyacht-go-2018.jpg 900 1440 Newthex https://newthex.com/wp-content/uploads/2017/06/newthex-logo-header-300x71.png Newthex2018-11-23 15:33:412018-11-23 15:37:47Did you miss us at the METS? Crew training for safe usage Ro-Ro ramp Will Black Pearl be awarded for best Sailing Yacht in 2019?